It’s time for the first International Incident Party for 2011!! And the theme for the first party? HOT DOGS!! 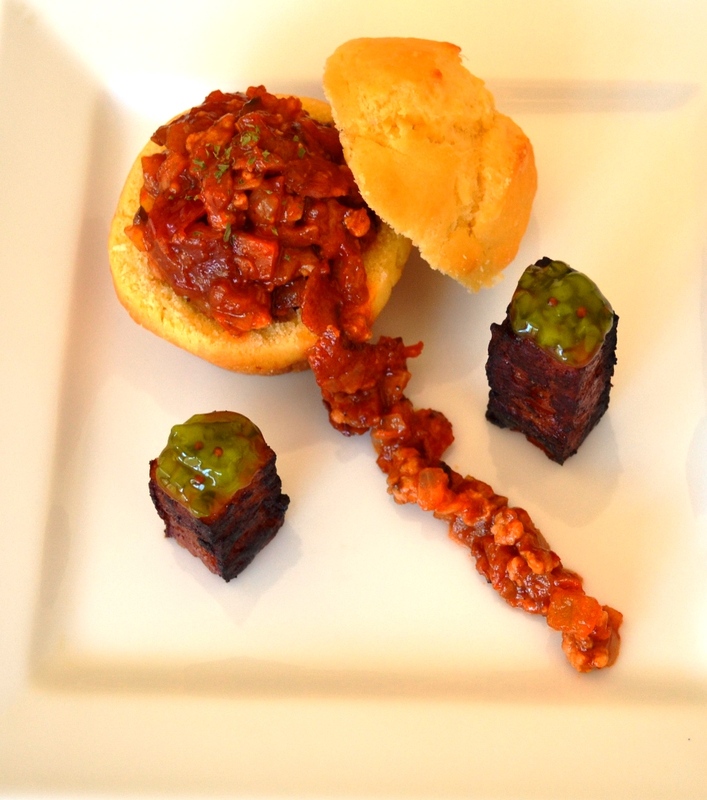 The Boy and I decided to up the stakes and intepret this dish on our own… we had two criterias… first it had to resemble a Bunny Chow and second, it had to emulate a deconstructed Coney Island Hot Dog…. Either way… here are the recipes for both of them…. for the brioche (bread) recipe, please see my post on Home-Made Brioche. Stir fry everything until the pork cooks throughly. Add in the chicken stock, Worcestershire sauce and tomato paste and let simmer for 5 minutes. 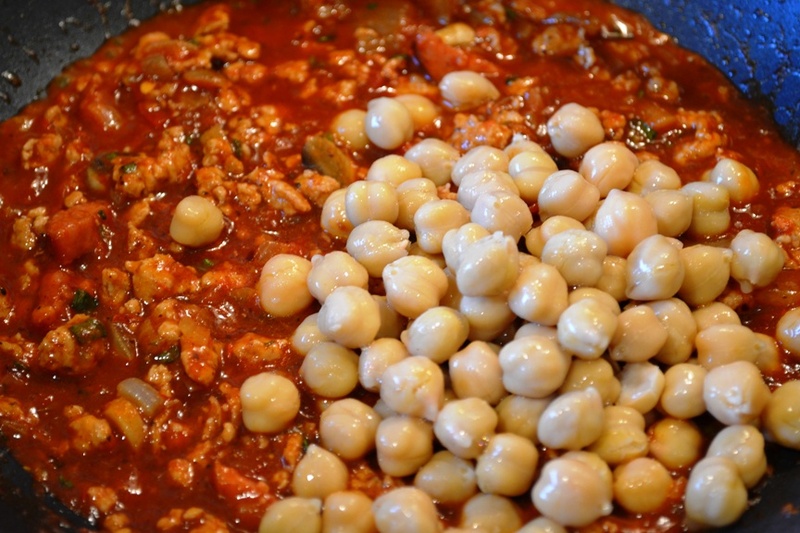 Add in the chickpeas, stir-through and let simmer for another 5 minutes. 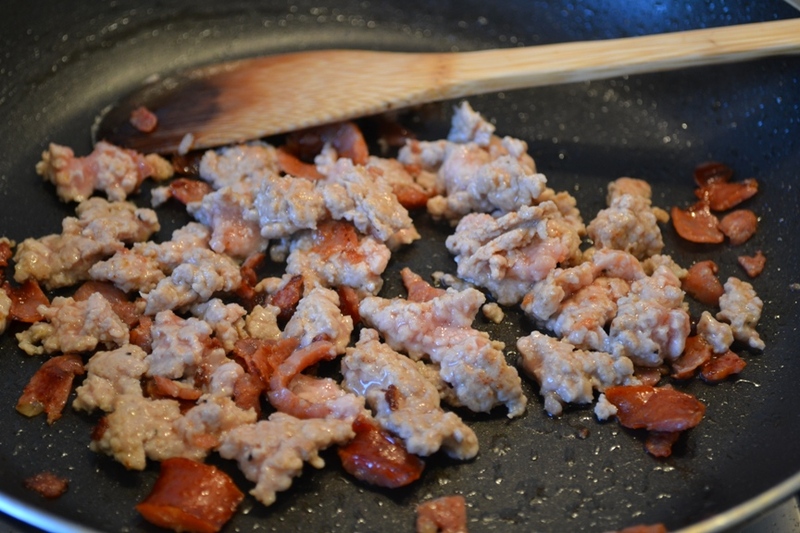 Meanwhile, pan-fry the chorizo quarters until crisp. Drain and set aside. Using the brioche, cut the top of the brioche and scrap out the inside with a teaspoon until it resembles a cup. 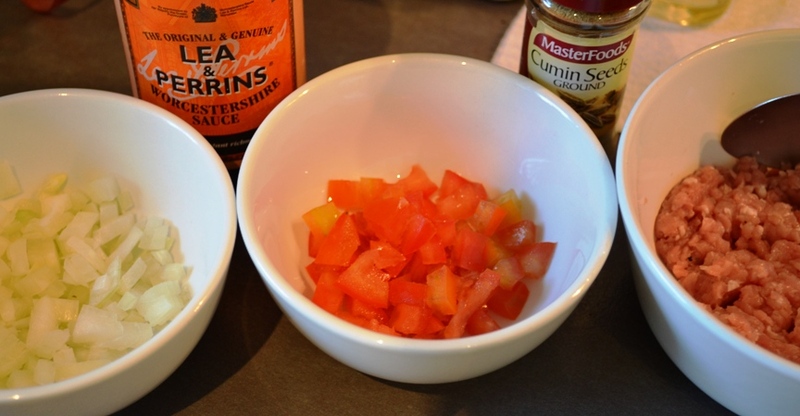 Decorate and serve as you wish with whole mustard grains, tomato relish, capers and gherkin. Feast your eyes (and tummy). I was so hungry after cooking and serving this up that I ate it all up before remembering that I didn’t take as many photos as I would have liked! Now for the Boy’s own interpretation (I wasn’t home when he did his, but you can see we both think alike in terms of the plating and cooking). ~200 grams minced pork (marinated with salt & pepper for approx. 3-5 hrs) – *you can substitute it with beef, chicken or turkey. 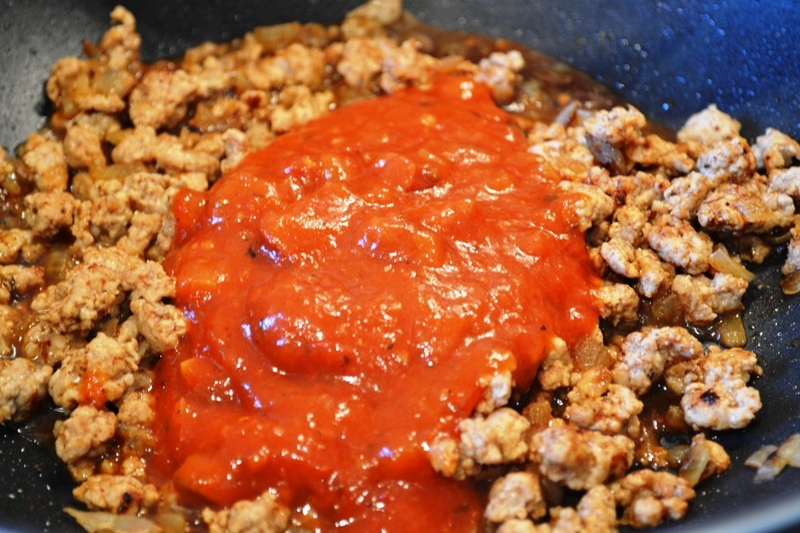 Cut the chorizo sausage into 2. Trim the sides and top of both sausages until you get a rectangular shape. Remember to keep the leftover (trimmed) chorizo for later. Pan fry the 2 Chorizo rectangles till crispy or slightly charred. Keep them aside. 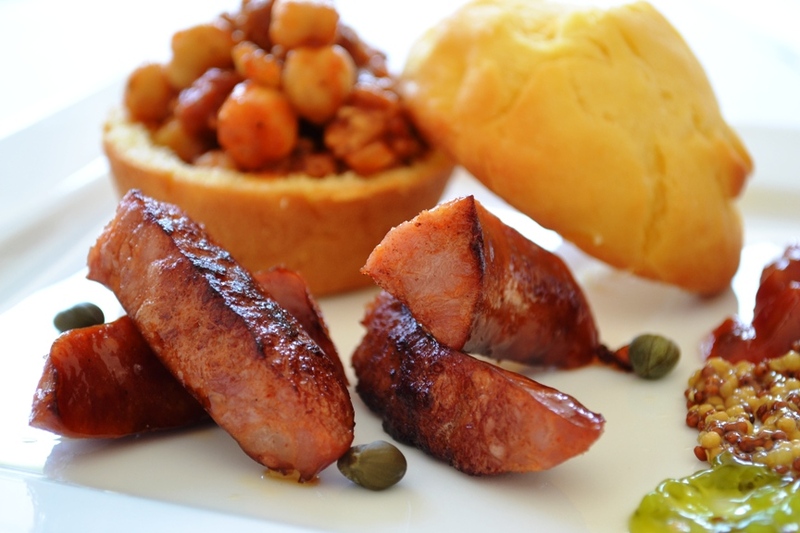 Dice the leftover chorizos and fry them in 1 tablespoon of oil on medium heat for 30-45 seconds. 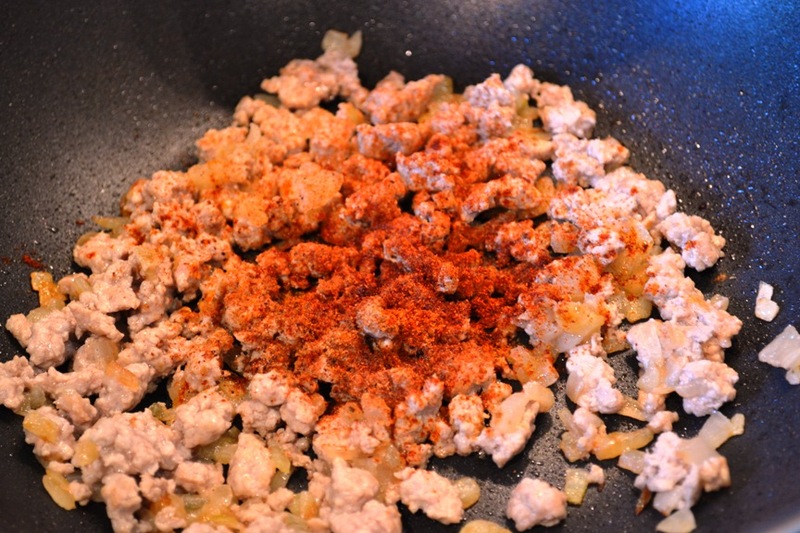 Add the minced pork and fry for another 1-2 minutes. Break the mince pork into smaller pieces as they tend to stick together. 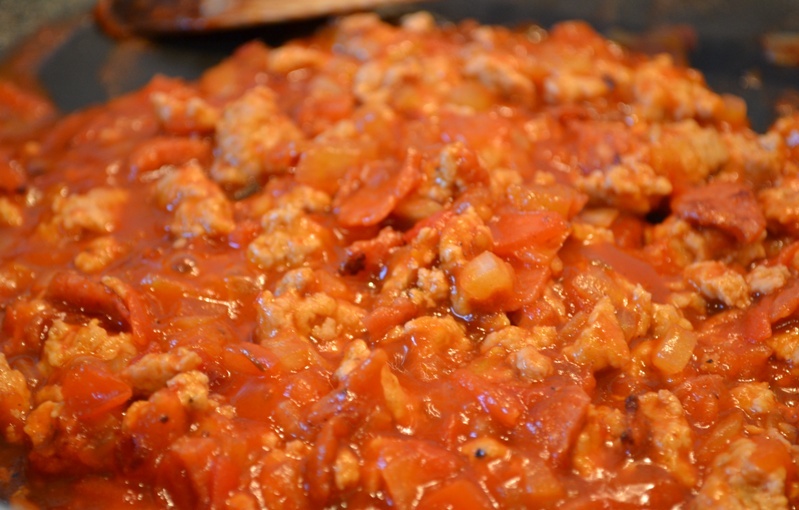 Add in the diced tomato, onion, ground cumin, celery seeds, black pepper, cayenne pepper, chilli powder, mustard, Worcestershire, sugar and salt. Give it a quick stir and continue to cook for another 1-2 minutes. Add in the tomato paste, tomato chutney and water. 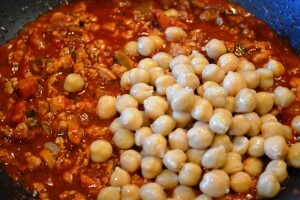 Lower the heat and let it simmer (uncovered) for about 30 minutes or until it thickens into a sauce like consistency. Give it a stir occasionally. While waiting for the sauce, prepare the bunny chow holder by cutting the top of the brioche and scrapping out the inside with a teaspoon until it resembles a cup. 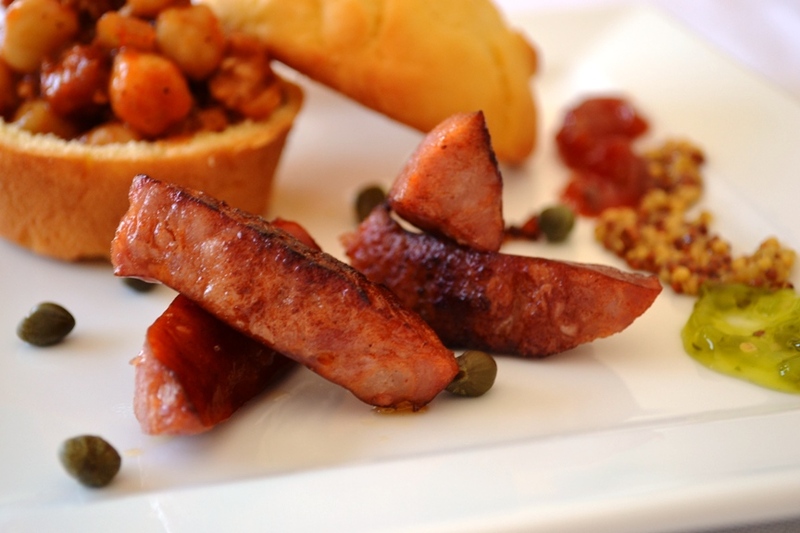 Stand the rectangular Chorizos on the plate and top it with gherkin relish or mustard if you prefer. Don’t you agree? He didn’t see my take on this, and yet… how similar does it look to mine? Thanks again to Jeroxie.com for hosting this fun event!! Please visit all these other fabulous foodies below to see their take on the International Incident Hot Dog Party! Super impressive work! 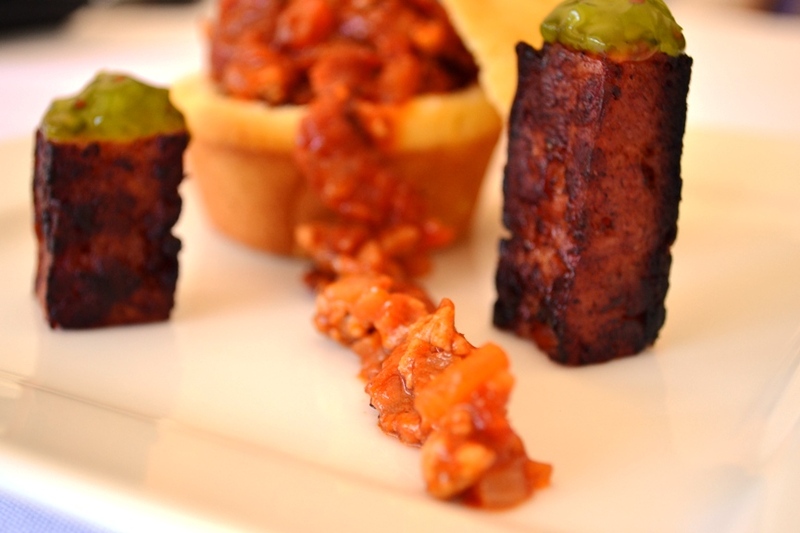 I’ve been really inspired by deconstructed dishes lately… too many degustations.. I know right… we’ve had so many! Thanks babe!! 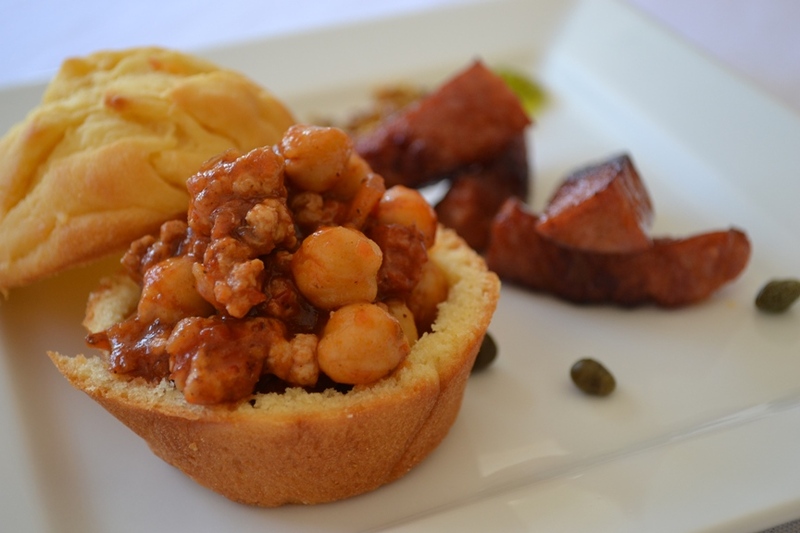 The real bunny chow uses curry… and I would love to go to South Africa to try the real thing!! They both look gorgeous and the similarities are really interesting. Your blog is absolutely beautiful. I’m just happy that IIP is exposing me to blogs I had not seen before, all of which are just amazing. I hope one day I can do something even half as good. Thank you for visiting! Your blog is great as well!!! Go iip!!! I’m going with deconstructed things lately… It’ll be a good trend too!! Fight fight fight! I am sitting on the fence on this. Both looks so so good. I need to give my mister a challenge too! Lols… Wasn’t sure if you’d get my comment.. ahahah… But yes! Another vote! Thank you!!! Super cool! I have always wanted to try bunny chow (you can’t find it anywhere in my part of the world I don’t think) and now you make me think I should just make my own. Only I’ll do it your way! Yumm. Yes… I live by the adage, if you can’t find it.. make it yourself! I’m now going to try making the real Bunny Chow! Haha, you two are hilarious. Dinner interpretation wars, commence! I have to say,, sorry to the boy, but I prefer the look of yours. His definitely wins for special effect though, as the ‘trail’ reminds me of a spinal column that has been ripped out of something’s body by a scary monster. I realise that this makes me quite weird that I am imagining this. I have watched too many horror movies. WuHoOooo!! oooOoo… that indeed sounds like a bit too many horror films… DO you watch Dexter too??? Hi Heather! 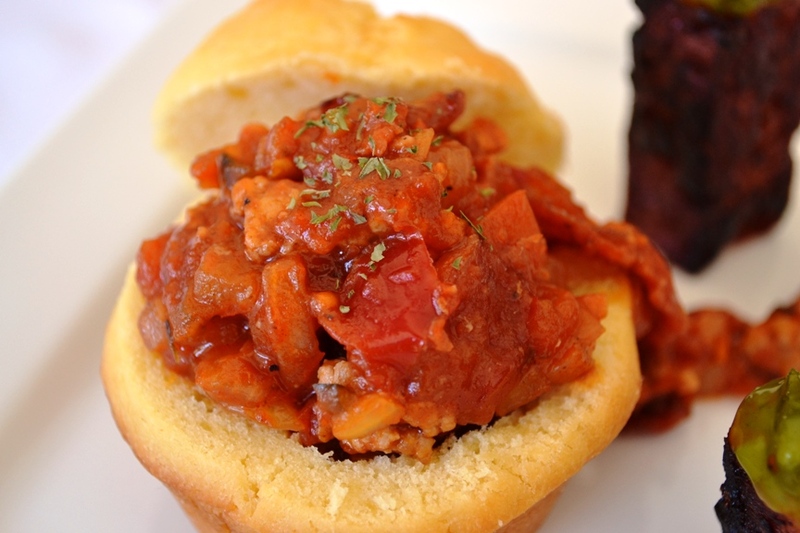 I hadn’t heard of Bunny Chow until a couple of days ago as well! So I wanted to replicate it 🙂 Thanks for dropping by! O this is torture, I’ve just finished dinner, but this has got me hungry. DAMN DAMN DAMN they both look SO good, I can’t pick just one. DAMN DAMN DAMN DAMN! Libby you have too! Hahaha… you don’t really…because I’m WINNING! hahahah… Modesty fail..
a Bunny Chow? i had to look that up on Wiki since i’d never heard the term before. we’ve got loads of Indian restaurants nearby where i live — i should ask for that and see what they say. whatever you call it, these look good. p.s. thanks for stopping by my blog.